Do you wonder how to hear God’s voice? How do you differentiate between the voice of God and the voice of the enemy, our flesh, or even our own thoughts? God often speaks through Scripture. But guess what? Satan also uses Scripture to rationalize sin in our lives. Just think of how Satan tried to get Jesus to sin. He tempted Jesus through quoting Scripture. This sends shivers down my spine. The voice of God is not audible, but it’s a clear impression that is similar to your own thoughts. This is why people often confuse God’s voice with their own thoughts or words from the enemy. 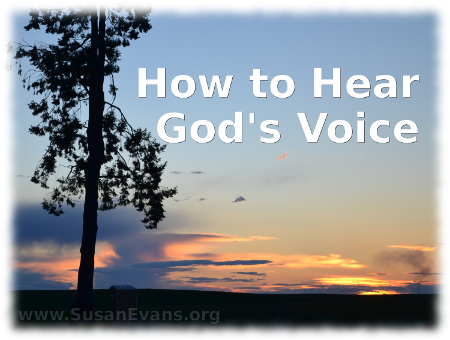 After teaching the session on How to Hear God’s Voice at the prayer Bible study in my home, many women asked for a chart that would help them to distinguish the voice of God from the voice of our flesh or the enemy. First I will list what God’s voice is like, and then I will list what the enemy’s voice is like. At the end, I will give you a downloadable PDF for you to print out, to help you visually see the differences. This entry was posted on Friday, November 15th, 2013 at 8:00 am	and is filed under Prayer. You can follow any responses to this entry through the RSS 2.0 feed. You can skip to the end and leave a response. Pinging is currently not allowed. This is a great go-to reminder of how God speaks to us! I think the most important of your list is “doesn’t go against scripture” and “selfless”. Those are the two easiest ways to root out if your desire is of you or of God! Since most of our actions are automatically self-serving, it’s easy to see when we are truly being selfless. I love God’s voice. He tells me some incredible things and they always come to pass. I love God’s voice, too. So many Christians say they can’t hear Him, but Scripture says, “My sheep hear My voice…” I think it’s unbelief and lack of repentance from sin that cause people to not connect directly with Jesus. Amen to that! Being in God’s perfect will beings rest to the soul. We’re going through an exciting time of teaching our youngest that he can’t hear God if he’s busy thinking and talking about his own ideas, that he has to stop and listen – just like he listens for mommy’s voice – to see if God has a suggestion or thought to share. What a great way to put it! We need to stop and listen. I’ve been finding this a little disconcerting, all the blogs I’ve read today, has hit my heart in so many ways, but most of all this one. I am a teacher, so when school broke for the summer, I literally buckled down because I was on this quest to hear God speak to me, because other people could be so distinct with when they’ve believed they heard God speaking to them so why can’t I? And one of my blog posts talks about this, but my problem often times is approaching it intellectually! It gets me every time, then when I do believe I’ve heard from him, I start doubting that I heard him right. It’s crazy! And what’s so frustrating for me, is that I’ve been a Christian for 18 years, and I still can’t seem to get this part right! I beat myself up about it constantly. …that chart was downloaded trust me. Good one! Glad that the chart was helpful! Just keep listening to the still, quiet voice of the Spirit, and that voice will become more discernible the more you hear Him. This is a helpful way to list a challenging topic! Hardly anyone talks about it, even though it’s a vital topic! This is such a good list and the same things I say when encouraging others to test the spirit. That’s a good idea–testing the spirits is a command we are supposed to obey, and we need to ask God for discernment not to believe every thought in our minds. This list is so helpful! I’m going to share this with a friend who I know would be encouraged. Glad this is helping people recognize the truth about God’s voice! This is so helpful, Susan! I wonder how many times I’ve thought I heard God but in reality, it was the devil??? Yikes! The printable is helpful too! Yes! We can gain discernment through some simple questions to ask ourselves. Glad you liked the printable!